You can add and save personalized branding styles to apply to your collages. This can include a logo, or design elements. When you click the Styles icon from the left toolbar, you'll be able to view and select the pre-populated Default Styles. If you have existing styles you've created and saved in the past, those will be shown under the Pinned Styles tab. Any of the default styles can be customized with your logo and text. They are designed to get you as close as possible to a finished style without having to start from the beginning. 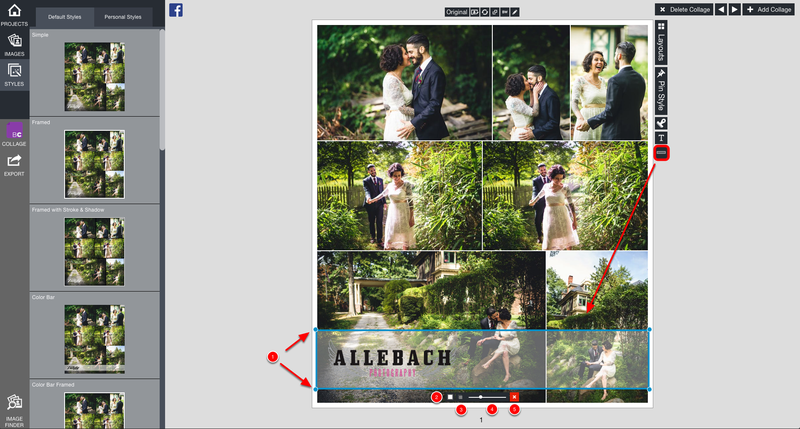 Style Tools are available to the right of your Collage in Collage View and allow you to customize the look of your Collage. 1) PIN STYLE: This tab allows you to save the Style on the current Collage for use on future Collages. Once Pinned, the Style will appear in your Pinned Styles. See the Pinned Styles section of this page for more information. 2) PERSONAL LOGO: This tab will allow you to import your logo(s). See the Personal Logo section of this page for more information. 3) CUSTOM TEXT: This tab allows you to add Custom Text to the Collage. See the Custom Text section of this page for more information. 4) HORIZONTAL COLOR BAR: This allows you to toggle a color bar in the style. See the Horizontal Color Bar section of this page for more information. Once you've designed a Style you like, clicking the Pin Style icon adds the style you created to your Personal Styles tab. To use a pinned style, click the style you want to use and it's immediately used on your collage. Any pinned styles in your personal styles will be saved with a pin icon inside the circle in the upper right. Your history will also show in this view. Anything without a pin is a history state. To delete a personal style, right-click and choose Delete. Click the Personal Logo tab to add a logo file to use in creating your personal style. Once you click the icon, you'll be taken to the Logo Import screen. Click the add image icon and navigate to your logo file. Please keep in mind that it must be a JPEG or PNG with transparency. Try to keep your logo file under 2,000 pixels. Once you have your logo imported, click the logo and it will be applied to your collage. 1) Resize or move the Drop Zone using the blue border, just you would with a Drop Zone in Album Builder. 2) Change the opacity of your logo. 3) Rotate the logo 90 degrees. 4) Delete the Drop Zone containing the logo. 1) Resize or move the Drop Zone using the blue border as you would with a Drop Zone in Album Builder. 2) Change the font to anything you have loaded on your system. 3) Rotate the text 90 degrees. 7) A slider to change the text opacity. 8) Edit the text. A dialogue box will appear where you can enter your text. Hitting the Return/Enter key will apply the text changes. 9) Delete the Drop Zone containing the text. You can click the Color Bar icon to toggle a color bar on/off. If you chose a default style that already has a color bar, it will already be displayed. Click the color bar icon to turn it off. 2) Change the color of the bar. 3) Color Bar Opacity, where you can lower the opacity of the color bar. 4) Delete the Color Bar.